Valentin le Désossé ("Valentin the Boneless"; 26 February 1843 – 4 March 1907) was the stage name of Jacques Renaudin, a French can-can dancer who was a star of the Moulin Rouge in the 1890s as the partner of Louise Weber, known as La Goulue (The Glutton). Not much is known about the life of Jacques Renaudin. He may have been the son of a notary from Sceaux, a commune in the southern suburbs of Paris, and it is thought that, as an adult, he worked as a wine merchant by day. It is certain, however, that at night he danced at the Moulin Rouge, the famed cabaret in the Pigalle district of Paris, near Montmartre. There he formed a partnership with La Goulue, dancing the chahut, a form of the can-can. As a team, they were the toast of tout le monde in fin de siècle Paris. Renaudin was tall and slender, with an aquiline nose and a prominent chin, which gave him a distinctive profile, and long arms and legs, which gave him an elongated silhouette. He acquired his stage name because of the elasticity of his articulations. With lengthy limbs, he could perform difficult contortions with unusual grace, almost as if he were boneless. Moving from position to position with astonishing fluidity and beauty, usually wearing a black suit and a top hat, he was much admired. According to legend, he danced 39,962 waltzes, 27,220 quadrilles, 14,966 polkas and mazurkas, and 1,000 lancers for a total of 83,112 performances on the stage of the Moulin Rouge. He never accepted pay for his extraordinary performances, as he danced merely for the love of it. He retired from the stage in 1895 and faded into obscurity. The can-can, spelled cancan in French and pronounced kãkã, is an acrobatic form of the quadrille. 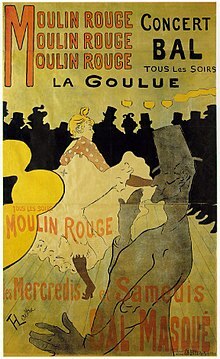 Popular in French music halls and cabarets throughout the latter half of the nineteenth century, it derived from the chahut, a rowdy dance performed at public ballrooms by students, working girls, and young clerks. Characterized by freedom from propriety and by enthusiastic abandon, it requires great flexibility and remarkable vivacity. With no set steps, it permits wild inventiveness of movement--spectacular leaps, high kicks, cartwheels, and jump splits. The popularity of the dance with young people began to fade in the mid-nineteenth century, but it was taken up, with great success, by performers in cabarets and music halls such as the Casino de Paris and the Moulin Rouge. It usually featured a bevy of female dancers wearing long, flaring skirts, flouncing petticoats, and black stockings, held up by garters. Valentin le Désossé was one of the few men to dance the can-can professionally. He was a popular attraction at the Moulin Rouge in the early 1890s. 1950. Novel. Pierre La Mure. Moulin Rouge. Based on the life of Henri de Toulouse-Lautrec. New York: Random House. 1952. Film. Moulin Rouge. Directed by John Houston. Romulus Films. A biography of Henri de Toulouse-Lautrec, with Katherine Kath as La Goulue and Walter Crisham as Valentin le Désossé. 1954. Film. French Cancan. A fictionalized history of the Moulin Rouge, written and directed by Jean Renois. Franco-London Films. With Françoise Arnoul as La Goulue and Phillipe Clay as Valentin le Désossé, called Nini and Casimir le Serpentin in the film. ^ Philippe Le Moal, ed., "Valentin le Désosséé," in Dictionnaire de la Danse (Paris: Éditions Larousse, 1999). ^ Walter Sorrell, "The Dancers of Toulouse-Lautrec," Dance Magazine (New York), October 1953, pp. 28-29, 66-67. ^ G. Desrat, Dictionnaire de la Danse (1895), reprint (Paris Adamant Media, 2001). ^ Jacques Pessis and Jacques Crépineau, The Moulin Rouge (New York: St. Martin's Press, 1990). ^ Francis Henry Gribble, "The Origin of the Can-Can" (April 1933), reprinted in Dancing Times (London), October 1990, pp. 53-54. ^ Renée Camus, "Cancan: Blurring the Line between Social Dance and Stage Performance," Society of Dance History Scholars, annual meeting, Proceedings, Baltimore, Md., October 2001. ^ Marie-Françoise Christout, "Can-can," in International Encyclopedia of Dance, edited by Selma Jeanne Cohen and others (New York: Oxford University Press, 1998), vol. 2, pp. 52-53. ^ Beth Genné, The Making of a Choreographer: Ninette de Valois and Bar aux Folies-Bergère, Studies in Dance History (Society of Dance History Scholars, 1996).